Herman Textile Window Fashions has been serving the Greater Cleveland area with finer quality window treatments since 1909. Our showroom in Highland Heights displays the most complete selection of window shadings alternatives from Hunter Douglas as well as the most current designer fabric and styling choices for your window treatments and upholstery. Our distinctive services include professional measuring, experienced installation and stylish recommendations from Joel Herman, designer and consultant, all provided with a local flair since we are independently owned and operated. We have earned the distinction of Gallery Dealer of Hunter Douglas Window Fashions, the industry leader in alternative window coverings. In addition, we continue to display finer designer fabrics for that special window dressing. 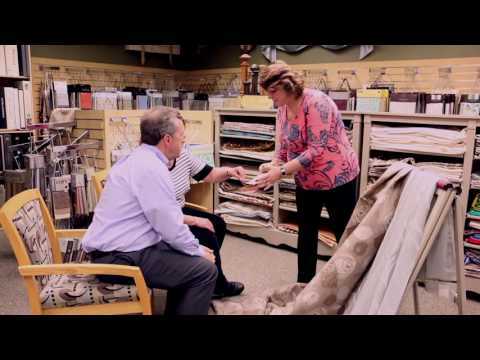 Our upholstery fabric selection includes the five largest upholstery lines in our industry, all for your review. Each customer, whether residential or commercial, receives personal assistance with an on-location appointment or at our Highland Heights showroom. Our open door showroom allows you to visit us with or without an appointment. We also offer in-home consultations for your convenience. All of our staff is professionally trained to provide outstanding services. Our professional design consultants will expertly answer your questions and ensure the perfect solution for your home is found -- no matter what your decorating style. Window coverings are our specialty, and our whole team will work with you to make your experience shopping with us is the very best it can be. Come visit our store today! Herman Textile Window Fashions specializes in quality window treatments as well as reupholstery services for your home or office. Explore creative ideas and smart solutions for your windows with our online brochure. It's the ideal introduction to Hunter Douglas window coverings, available at Herman Textile Window Fashions. Herman Textile Window Fashions offers a large selection of custom Hunter Douglas window treatments, including sheers and shadings, honeycomb shades, shutters, horizontal blinds, vertical blinds, Roman shades, roller shades, and woven wood shades. We serve Northeast Ohio including Cuyahoga, Lake, Portage, Geauga Counties and surrounding the surrounding areas. Please contact us, and let us know how we can help you.